In the winter of 1885, the British GALATEA had challenged the New York yacht club to a match race for the twice defended America's cup. The Americans responded by building the centerboard sloop MAYFLOWER. 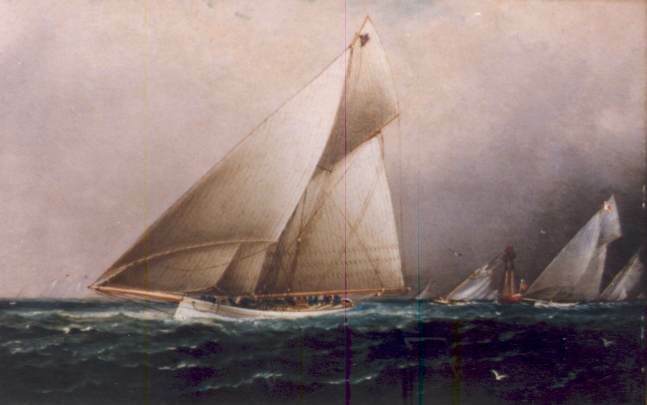 This painting depicts the two yachts, GALATEA, designed by Beavor-Webb and owned by Lt. and Mrs. William Henn of the Royal Northern Yacht Club, and the Burgess designed MAYFLOWER owned by General Paine, racing past the Sandy Hook lighthouse in the 1886 cup race. Of the many works that Buttersworth created, the most desirable subject matter has been that of the America's cup races in New York Harbor, which is the location of this excellent work. The largest collection of Buttersworth paintings is today housed in the clubhouse of the New York Yacht Club.